March 24th, Staring Bentley Christie! I’m in a rush to get this newsflash out to you. If you’re into worm farming for the purpose of recycling kitchen scraps, manure, leaves, and pretty much anything for growing wonderful crops and ornamentals…You’ll love this! My good friend, Bentley “Compost Guy” Christie has landed a pretty cool gig. He’ll be giving a presentation on Vermi-Trenches vs Vermi-Planters. 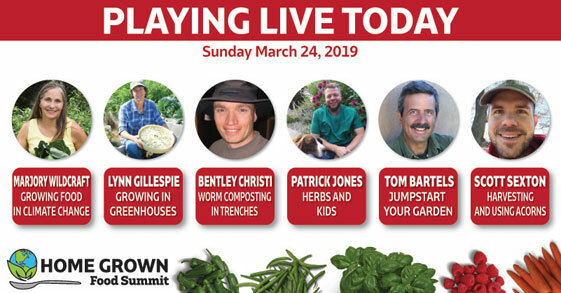 Home Grown Food Summit 2019! It’s all FREE FREE FREE! But YOU NEED TO REGISTER NOW to watch Bentley and others! There will be 36 experts giving presentations on various topics. Marjory Wildcraft holds this summit every year and there’s always something to take from it. I think it’s very exciting to be able to watch Bentley’s presentation. I haven’t even seen it yet, but I’ll have the popcorn ready and rooting for him big time. The COOL THING is, Marjory hasn’t had a really professional worm farming presenter until now. It’s about 1 hour and if you LOVE digging in the dirt like I do (yeah, I’m old school I guess. I REALLY love getting dirty), you’ll love learning a new way to grow and sustain your plants while giving them the proper environment and nutrients they need. I’ve seen Bentley’s plants too. He puts his money where his mouth is. This will also be a great way for you to find out if a Vermi-Trench is something you’ll want to do. I know I’m late in getting the word out, but you have plenty of time to prepare for Bentley’s presentation on the 24th. In the meantime, the summit starts tomorrow and there will be plenty going on. If you’ve never heard of the Home Grown Food Summit, go check it out and register. We’re talking hours of video presentations on a host of topics. Hurry for the 40% Discount she’s offering. Remember, the picture says Live Today, but it’s not till Sunday the 24th. Please give him your support.